With low-power GPS and offline maps, it was built specifically for outdoor use. Casio's second watch, the WSD-F20, doesn't look much different than the outdoor smartwatch it revealed at last year's CES. However, the software brains inside the rugged-ized timepiece have been given a strong nudge forward. This is one of the first Android Wear 2.0 devices to surface, over half a year since we first got to play with Google's retooled wearable OS. The watch -- designed for outdoor types -- also comes equipped with low-power GPS and color maps that can be downloaded offline for true outdoorsmen and women. You will survive. Yep, as we said earlier, the design is very similar to the original. 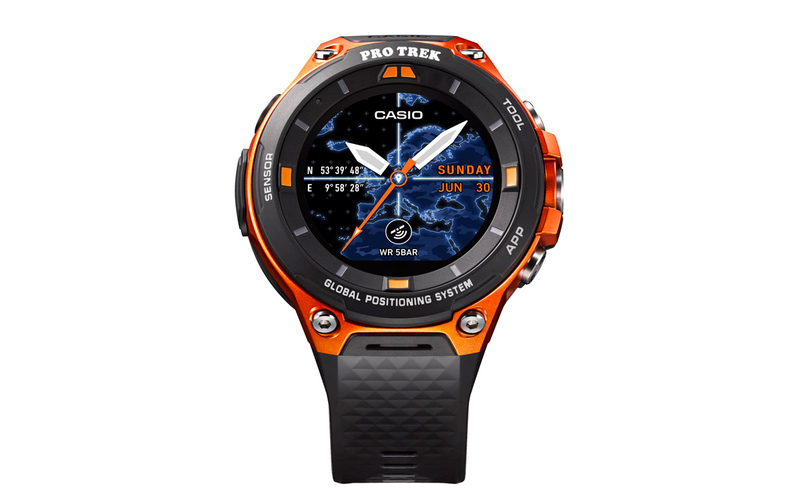 Casio has, however, added button guards and a new protective bezel -- important when your outdoors watch costs a few hundred dollars. For ease of use while wrestling bears or kayaking for your life, the buttons are now different sizes to help differentiate them in the thick of your battle with nature. In addition to specific tracking and assistance apps, there's also something called "Location Memory." This gives you a one-button location readout, and doubles as a location marker. You can add notes to these tagged spots as well through speech recognition on the smartwatch. Meanwhile, a feature called "Moment Setter" allows you to preprogram notifications, making the display light up dependent on sunset times or remaining altitude to climb. Aesthetically, you'll also be able to choose more original watch-face designs that tap into the low-power GPS or offline maps you've stored. It's not a watch for everyone, but perhaps that's the point: It's an unapologetic rugged-ized smartwatch, and it must have been popular enough for Casio to make a sequel. What if you bought said predecessor just months ago? Well, there's some good news: The older WSD-F10 will be upgradable to Android Wear 2.0 this spring.